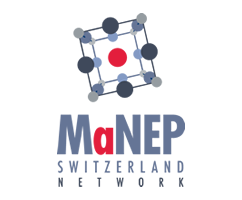 This is the story of a strong collaboration between academic and industrial partners, both members of MaNEP Network. 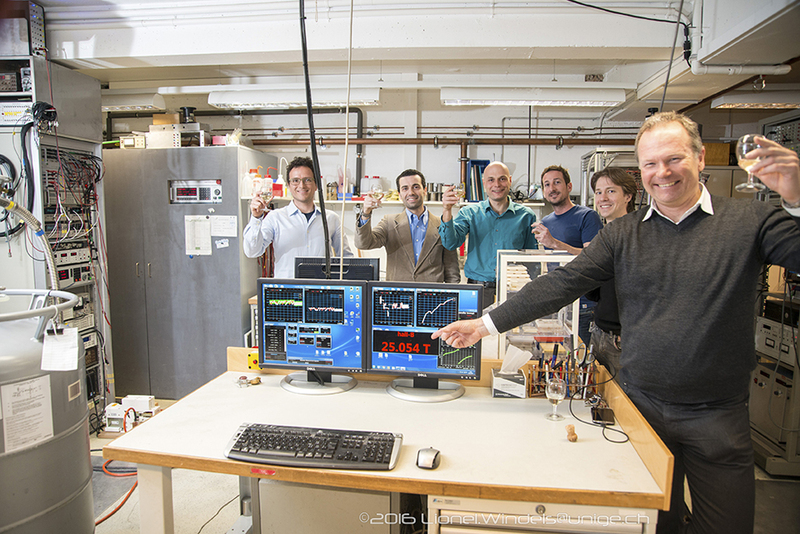 Together, they successfully developed and tested the first superconducting coil able to reach a magnetic field of 25 Tesla. A first in Europe. Read the press release. In collaboration with Bruker Biospin, you recently reached a significant record. What are these new results and what was the purpose of the project ? We have designed, constructed and tested a demonstrator coil based on High Temperature Superconductors (HTS) aiming at a field increase of 4 T over a background field of 21 T. In March 2016, we successfully achieved our goal, generating a magnetic field of 25 T and, thus, obtaining the European record of highest non-resistively generated magnetic field. Concerning the scope of the project, high magnetic fields are an indispensable tool for research in physics and material science as well as medical applications. To further push the boundaries of science, research magnets, magnetic resonance systems and particle accelerators call for ever increasing magnetic fields. This technological need represents the driver for the development of HTS, as they are the only means to generate fields well above 20 T.
In this work, what are the main contributions of UNIGE ? The success in the development of superconducting magnets based on HTS relies on the control of the electrical, mechanical and thermal properties of the conductors. The most promising material for these applications is YBCO, a superconducting cuprate with a critical temperature of 92 K and an upper critical field above 100 T. The only way to fabricate practical conductors is by coating a thin layer of YBCO on a metallic substrate upon which several oxide buffer layers have been deposited to provide the template for the growth of the superconducting layer. However, this conductor technology is relatively young and the design of YBCO-based magnets still poses several fundamental and engineering challenges. Our role in the project was to build the level of material understanding and control necessary to enable the practical realization of the insert coil that generated the record field. How would you define your collaboration with Bruker BioSpin and what are the keys to this success ? The collaboration with Bruker is very motivating. 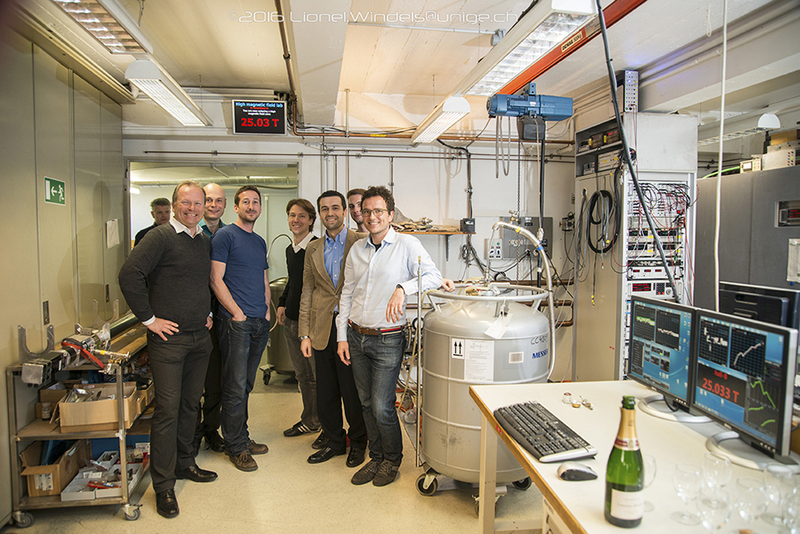 Since many years, UNIGE and Bruker Biospin have been working together within several collaboration frameworks, the goal being the development of both low- and high-Tc technical superconductors with enhanced properties in high magnetic fields. In particular, the issues involved to achieve the goal of generating 25 T were localized at the frontier between material science and magnet engineering: the key element for the success was an intense interface between academy and industry. Is the impact of these results strategically significant ? And to what extent is this new record important for Switzerland ? It is clear that ultra-high field magnets are one of the main classes of applications that will profit from the exceptional properties of YBCO-based conductors. The conductor technology as it clearly appears from the results obtained within this collaboration is still in strong development. In this situation of great excitement, we have set the basis to play a leading role in terms of technology development and material know-how. Do you have other promising research projects ? My group performs research ranging from the fundamental level to the practical implementation of superconductors. Even the basic research is use-inspired and focuses on the control of the physical properties required for the improvement of the superconductors’ performance, to be transferred to the processing of practical conductors. In particular, we are strongly involved in the wire development program driven by the CERN Future Circular Collider (FCC) study. CERN is planning for the post-LHC accelerator to extend the energy frontier to 100 TeV collision energy and this will depend on the feasibility of novel high-field dipoles in the 16 T range. At present, the idea is to build these magnets using Nb3Sn wires, but their critical current must exceed by at least 50% the best performance achieved today. Even if Nb3Sn is an “old” classical superconductor, it will be necessary to re-invent the material in order to meet the challenging target of FCC. Why did you decide to collaborate with scientists in a university for this project ? And what asset does this kind of collaboration bring to your company ? The project that we just concluded represented the ideal win-win situation where the research partner could profit from a vast and accurate material characterization campaign by leveraging on their core expertise, while Bruker could profit from the accumulated material properties and academic research and contribute with its multi-year coil design, winding and manufacturing experience. The testing facilities and competences at the University of Geneva represent something very rare around the world and we are happy to bring our collaborations forward with them. In this work, what are the contributions of Bruker ? One could say that Bruker contribution for this goal extends over a period of more than 10 years! In fact, the 21 T magnet where the HTS insert was tested is coming from Bruker as well. We combined the recently developed coil winding technologies based on HTS conductors with the technical know-how embedded in the 21 T outsert. This guarantees an optimal design and allows coil operations in a safe environment up to 25 T. We are very proud for being able to extend the capabilities of the original 21 T system beyond the physical and intrinsic limitations of the superconducting material employed in that magnet. Is this innovation ready to be commercialized ? What are the next steps and challenges ? Bruker’s focus remains NMR and the coil developed within the collaboration with Prof. Senatore is quite far from a typical NMR magnet. However the successful test of the 25 T coil represents a positive test-bench of ideas that we are developing for the next-generation HTS-based NMR magnets. We see that commercial breakthroughs in this field are at reach and 2017-2018 is going to be a very exciting period for Bruker and the NMR community. How would you define your collaboration with the team of UNIGE and what are the keys to this success ? The collaboration has been very successful and the key elements for this outstanding result are mainly three: 1) a clear definition of the roles and expected contribution of each partner within the collaboration, 2) having skilled, motivated and passionate persons working on challenging technical and scientific tasks, 3) frequent status updates and exchange of ideas along the evolution of the project. The group of Prof. Senatore has the optimal mix of characteristics needed for a successful collaboration in this field and we are looking forward to extend our interaction in the years to come since the technologies that we are working on are rather new and therefore we need a better understanding of the fundamental underlying physics of those compounds and materials. What are the main challenges Bruker BioSpin is facing today ? 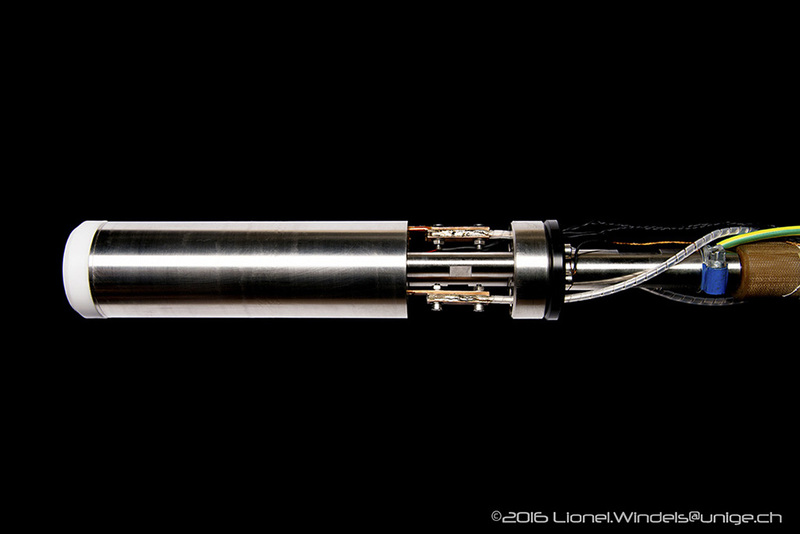 On the side of high and ultra-high field NMR systems, Bruker is working to overcome the physical limitations of classical superconductors that powered our systems until present. The introduction of a new superconducting material is far from being simple because the differences with established technologies are large and a full set of new technologies and production processes must be put in place before having the first commercial products on the market. From a different perspective, we are also trying to make NMR systems more user friendly in order to reduce as much as possible the complexity and life-time costs during operation. In this sense material science can also greatly help us: for example, HTS materials like those used for the 25 T coil, can work at temperatures much higher than classical superconductors making possible the construction of systems free of cryogenic fluids like liquid Helium and Nitrogen. This greatly simplifies the requirements related to the laboratory infrastructure and the safety procedures needed during magnet operation. We believe that increasing the accessibility to our systems by removing the larger barriers will have a very positive impact on customer satisfaction and directly on our business. With the actual technological developments, are the collaborations with scientists in universities necessary to stay competitive in your field ? This is a very general trend that can be observed in all businesses strongly focusing on technology and material science: there are now many companies working with a large network of partners in so-called open innovation platforms or crowdfunding. For many technology-based products, quantum leap in terms of performance come often with huge R&D costs that few companies around the world can realistically and independently sustain. By splitting and spreading innovation tasks over a large base and by leveraging on specific and highly competent research teams allows sorting out the most promising development paths relatively fast and in often win-win situations. NMR and MRI products are no exception and require an important support from research institutes in the fields of material science and applied superconductivity. This is particularly true in this historical context where the industry is trying to upgrade its traditional products by taking advantage of materials discovered in the last thirty years (high-temperature superconductivity was discovered in 1986) and for which no solid and widespread application is yet available on the market.
" Bruker Biospin’s mission is to produce outstanding and user-friendly scientific equipment based on the principle of nuclear magnetic resonance allowing our customers to seamlessly analyse and study the properties of molecules in liquids and solid compounds ", says Riccardo Tediosi. This project targets new surface treatments for injection moulds manufactured by electro-erosion.